University of Virginia Library Online Exhibits | Photograph of University of Virginia Board of Visitors, including Mary Cooke Branch Munford, taken at the appointment of John Lloyd Newcomb as second president of the University of Virginia. 1933. Photograph of University of Virginia Board of Visitors, including Mary Cooke Branch Munford, taken at the appointment of John Lloyd Newcomb as second president of the University of Virginia. 1933. 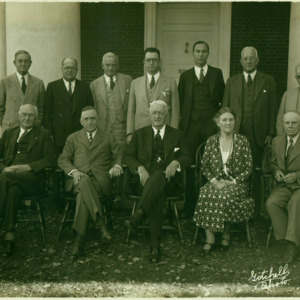 “Photograph of University of Virginia Board of Visitors, including Mary Cooke Branch Munford, taken at the appointment of John Lloyd Newcomb as second president of the University of Virginia. 1933.,” University of Virginia Library Online Exhibits, accessed April 24, 2019, https://explore.lib.virginia.edu/items/show/2216.